This past Friday, Senator Jon Kyl, Undersecretary of Agriculture Jim Hubbard, and Acting Deputy Chief of the US Forest Service Chris French visited the Flagstaff Watershed Protection Project (FWPP). The event was part of a three-stop forest tour orchestrated by Dr Wally Covington and Diane Vosick of NAU’s Ecological Restoration Institute. 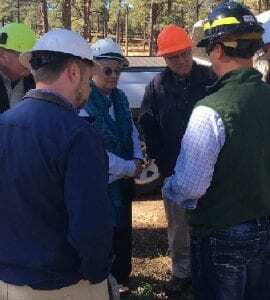 Hosted by Laura Jo West, Coconino National Forest Supervisor, Erin Carey, Acting Ranger of the Flagstaff District, Vice-Mayor Jamie Whelan, and City FWPP staff, the site visit allowed the visitors to see first-hand on-going operations and learn about status, plans, and needs moving forward. In addition to the visit, the AZ Daily Sun has written an article discussing the status of FWPP Phase II, and well as highlights from Senator Kyl’s visit. Read it here. 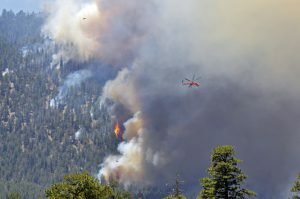 Arizona State Forester Jeff Whitney discusses wildfire threats in Arizona, and what communities and land managers are doing to address the threat. In the interview with Carpe Diem West, Mr Whitney highlights several projects across Arizona, including the Flagstaff Watershed Protection Project! Bids Received for FWPP Phase 1 Mechanical! The FWPP Phase 1 mechanical thinning contract was again advertised for rebid during a 30 day period from March 31st to April 30th, 2018. Sealed bids were opened in public at the Coconino National Forest Office at 10 a.m. local time on May 1st, 2018. Bids for the second offering of the FWPP Phase 1 timber sale were received, and the Forest Service is in the process of awarding the Phase 1 contract to the apparent high bidder. A representative from the Flagstaff Ranger District of the Coconino National Forest, presented on the Flagstaff Watershed Protection Project (FWPP) at a conference hosted by the Western Governors’ Association. District Ranger Mike Elson introduced the project and discussed how strong collaborative partnerships between local, state, and federal entities have been important for the ongoing success of FWPP. FLAGSTAFF, AZ – The Flagstaff Watershed Protection Project is celebrating its 5-year anniversary with a special community event at Mother Road Brewing Co. on Fri, Oct. 13. Since great-tasting beer starts with clean water, there is reason to celebrate a project that reduces fire risk to area watersheds. The FWPP was approved by city voters through a $10 million bond initiative in November 2012. 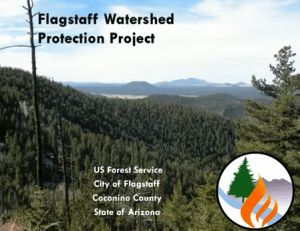 The project is a partnership effort between city of Flagstaff, the Coconino National Forest, and the state of Arizona to help reduce the risk of severe wildfire and post-fire flooding in critical watersheds. The project has achieved significant progress delivering on the initiative’s agenda that was presented to voters in the 2012 general election. An environmental analysis of more than 15,000 acres was completed and approved in the first three years—a triumph for a project of its complexity and size. Over the past five years, crews and contractors have mobilized to implement fuels reduction treatments on nearly 5,000 acres throughout the project footprint, including Observatory Mesa, state lands within the City and on federal land in the Dry Lake Hills area. 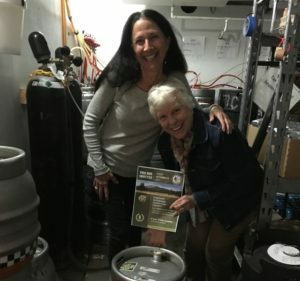 To celebrate the project’s 5-year milestone, Mother Road Brewery created a special batch of “FWPP watershed beer” and will tap it at the anniversary event. This is a special partnership between a local business that uses water for its products and an initiative aimed at preserving critical watersheds and the community’s water supply. The Greater Flagstaff Forests Partnership invites the public to join members of the FWPP in celebrating the project’s progress and success at Mother Road Brewing Co., 7 S. Mikes Pike, from 6–7 p.m. on Fri, Oct. 13. For more information about FWPP, visit http://www.flagstaffwatershedprotection.org. The Hardy Fire scorched southeast of Flagstaff in June of 2010, drawing dangerously close to several neighborhoods and forcing Flagstaff Fire Department officials to implement mandatory evacuations. Luck would have it that forested areas around the Little America hotel had been treated to diminish fire intensity, allowing firefighters to contain the fire that had, at one point, jumped across a nearly eighth of a mile Rio De Flag drainage. After several days, when firefighters had containment in their sight, the Hardy fire’s big sister peeked out as black smoke rising above mountains to the north— the Schultz fire had begun it’s run. The days that followed serve as a sharp reminder of the devastation forest fires can present. Nearly 50 homes northeast of the city were damaged by the subsequent flooding and 15,000 acres of forest were destroyed. City of Flagstaff officials, realizing the necessity of forest treatments near the city to avoid a more disastrous repeat of the Schultz fire, began a public awareness campaign in 2012 that culminated in the passage of proposition 405 in November to allocate $10 million of taxpayer money on what is now known as the Flagstaff Watershed Protection Project (FWPP). Voters approved the proposition with a near 74 percent approval rating. Unlike other locally sourced funding for similar projects around the nation, Flagstaff’s is the first to result from a direct citizen vote. Other projects rely on utility fees over time for preservation projects, whereas Flagstaff’s model allows for quicker implementation with immediate funding.